↑ 1.00 1.01 1.02 1.03 1.04 1.05 1.06 1.07 1.08 1.09 1.10 1.11 "Online World of Wrestling profile". Online World of Wrestling. สืบค้นเมื่อ 2010-05-19. ↑ Gerweck, Steve (2011-02-09). "Brother Devon accepting independent bookings". WrestleView. Archived from the original on 2011-02-13. สืบค้นเมื่อ 2011-02-10. ↑ 3.0 3.1 3.2 "TNA Wrestling profile". Total Nonstop Action Wrestling. Archived from the original on 2011-06-30. สืบค้นเมื่อ 2010-12-16. ↑ 4.0 4.1 4.2 4.3 Milner, John M.; Kamchen, Richard. "The Dudley Boys". Slam! Sports. Canadian Online Explorer. สืบค้นเมื่อ 2009-04-30. ↑ Caldwell, James. 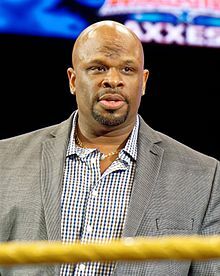 "One half of the Dudleys begins backstage WWE role". Pro Wrestling Torch. สืบค้นเมื่อ September 26, 2016. ↑ 7.0 7.1 Caldwell, James (2012-03-18). "Caldwell's TNA Victory Road PPV results 3/18: Ongoing "virtual time" coverage of live PPV – Sting-Roode main event, Angle-Hardy, Storm-Ray". Pro Wrestling Torch. สืบค้นเมื่อ 2012-03-18. ↑ 8.0 8.1 8.2 Royal Duncan & Gary Will (2000). Wrestling Title Histories (4th ed.). Archeus Communications. ISBN 0-9698161-5-4. ↑ "The PWI Awards". Pro Wrestling Illustrated. 34 (3): 32–33. 2013. ↑ 10.0 10.1 "The PWI Awards". Pro Wrestling Illustrated. 33 (3): 98. 2012. ↑ "The PWI Awards". Pro Wrestling Illustrated. 33 (3): 96–97. 2012. ↑ "Pro Wrestling Illustrated (PWI) 500 for 2012". The Internet Wrestling Database. สืบค้นเมื่อ 2012-08-25. ↑ "WWE Wrestler(s) of the Year". Rolling Stone. สืบค้นเมื่อ December 14, 2015. ↑ "2CW Tag Team Championship history". หน้านี้แก้ไขล่าสุดเมื่อวันที่ 20 มิถุนายน 2561 เวลา 22:32 น.